The team behind the Morpeth Neighbourhood Plan (MNP) has received a huge boost. Independent examiner Chris Collison has recommended that, with some modifications to better align it with national planning policy guidance, it should go forward to a referendum. The document sets out policies and community actions to support the local economy, transport measures, leisure facilities, heritage, the environment and education provision. It also defines settlement boundaries for the plan area of Morpeth, Hebron, Hepscott, Mitford and Pegswood. It was put together by a steering group – led by Morpeth Town Council – following public consultation periods. The aim of the group was to produce a wide-ranging and realistic, yet aspirational plan that allows for sustainable growth and meets national planning requirements. Northumberland County Council will now review the recommendations made by the Examiner and amend the MNP. It is expected that the referendum, involving all electors in the plan area, will take place at the very end of this year or beginning of next year. Town councillor Joan Tebbutt, chair of the MNP steering group, said: “The enormously complex and detailed work involved in preparing the MNP has been much more demanding and daunting than any of us anticipated, since we were originally informed by the Government that neighbourhood planning was intended to be a ‘light touch’ process. “I encourage the whole community to support the plan when the referendum takes place. “It is very evident from what we see happening in Morpeth now that what we desperately needed was a plan of this nature, especially since the county council’s new Local Plan for Northumberland has not yet been finalised. She added: “Residents of the plan area are hugely indebted to members of the Plan Preparation Group (PPG), who spent countless hours over many months drafting the plan, making amendments following two periods of public consultation and bringing the submitted documentation to a highly professional standard. “The PPG was very ably led by Coun Nic Best and it included Philip Ashmore, Ed Campbell, Simon Cox, Alan Jones, Peter Scott, Graeme Trotter and David Woodard, as well as myself. “In addition we had significant support from our planning consultant Ian Campbell and from county council planning officers David English and David Rowlinson. If the majority of residents vote in favour of the MNP, it will then be formally ‘made’, form part of the county’s development plan and carry weight when planning bids in the plan area are considered. County planning officers have provided technical support and background research during the process. 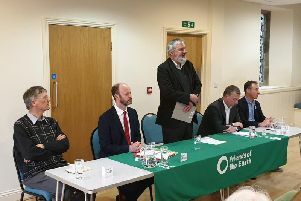 Coun Allan Hepple, the county council’s cabinet member responsible for planning, said: “We will be looking closely at the report and considering the modifications recommended, in conjunction with the steering group.